A crackling fire, a steamy bubble bath and a healthy indoor climate. Our home should be our daily small resort. Thereby, fireplaces and gas boilers contribute significantly to our everyday life comfort. However, it is vitally important, that all devices are sufficiently supplied with combustion air, otherwise the formation of toxic gases will be a result. Our chimney sweepers bear the responsibility, that we do not hover between life and death when using our everyday living comfort. Due to tight building envelopes chimney sweepers increasingly face a great challenge. 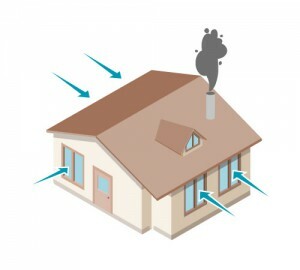 In case of room air dependent fireplaces the air necessary for the combustion need to slipstream from outside to the set up. The incoming air creates a proper combustion (no formation of carbon monoxide) and also ensures the evacuation of exhaust gases by avoiding a critical low pressure in the room. An adequate supply of combustion air is therefore required by law – the technical regulations for gas installations DVGW-TRGI as well as the Model Building Regulations MBO and State Building Codes respectively are the relevant German regulations. Egal welche dieser Maßnahmen zum Zuge kommt, der Ärger ist vorprogrammiert. Wir bieten für diese Problemstellung Lösungen an, die von den Wohnungsnutzern akzeptiert werden, weil sie nicht nur kostengünstig sind, sonder auch angenehm und unauffällig.